This experience is like taking an exam in school where you're wondering what the hell the answers are (that is, you're wondering how to sell more of your product or service). EXCEPT imagine you're sitting next to the smartest guy in the class and he's showing you ALL the answers! 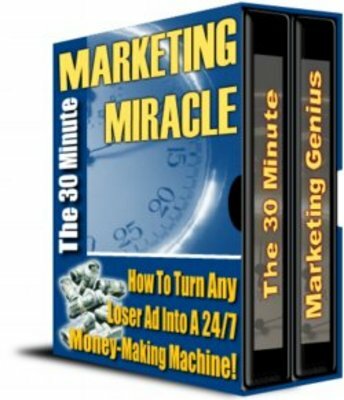 In fact, it's unfair to your competition to have this marketing genius reveal the secrets he uses to create million dollar ads! You get the inside advantage normally reserved only for the rich who can afford the one-on-one help! -- EXCEPT the killer secrets you're getting are all about making your ads pull MEGA response ... and MAXIMUM money - using low cost ... and sometimes no-cost ... methods! You HAVE full rights to sell this eBook. You MAY sell it as a standalone product (it was designed to sell well this way). The recommended sales price for this product is $39. You MAY offer it as a bonus or bundle it into a package or membership site if you wish. Your MAY NOT give it away as a freebie. Your customer MUST pay you something to receive a copy. You MAY sell it from your web site. You MAY sell it from online auctions.